Luke Rockhold is finally making the leap to 205. The former middleweight champion is reported to be facing Jan Blachowicz at UFC 239 on July 6 in Las Vegas, Nevada. Sources close to MMA News have confirmed the bout initially reported by ESPN. Luke Rockhold has been planning jumping up for some time now and has long been eyeing a clash with Jon Jones in the future. Rockhold has now followed through on this change in career path and will test the waters at 205 when he takes on #6-ranked Jan Blachowicz. Luke Rockhold is a former middleweight champion in the UFC as well as Strikeforce. Rockhold has put together a solid résumé in his career, holding victories over names like Jacare Souza, Michael Bisping, Lyota Machida, Chris Weidman, and many others. In Rockhold’s last outing, he suffered a devastating knockout loss to Yoel Romero at UFC 221. Following the loss, Rockhold made the decision that it is time for a change. 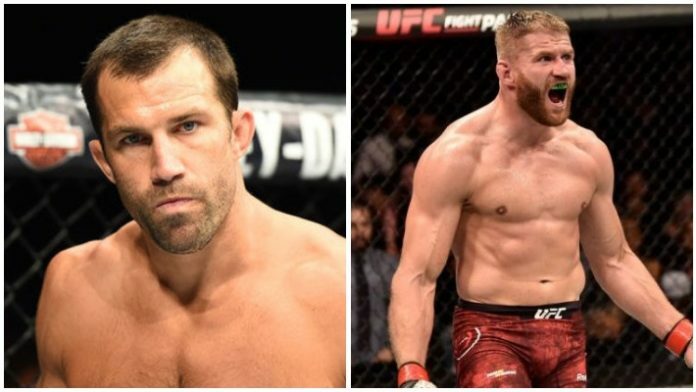 Luke Rockhold was originally planning to make his light heavyweight debut against Alexander Gustafsson last August at UFC 227, unfortunately Rockhold suffered a leg injury and has remained sidelined since. UFC 239 currently does not have a main event. The event will take place from the T-Mobile Arena in Las Vegas, Nevada on July 6, 2019. What is your prediction for this light heavyweight bout? Will Luke Rockhold have a successful 205 debut against Jan Blachowicz?